Looking for an award-winning blueberry hand pie recipe? You’ve found it! 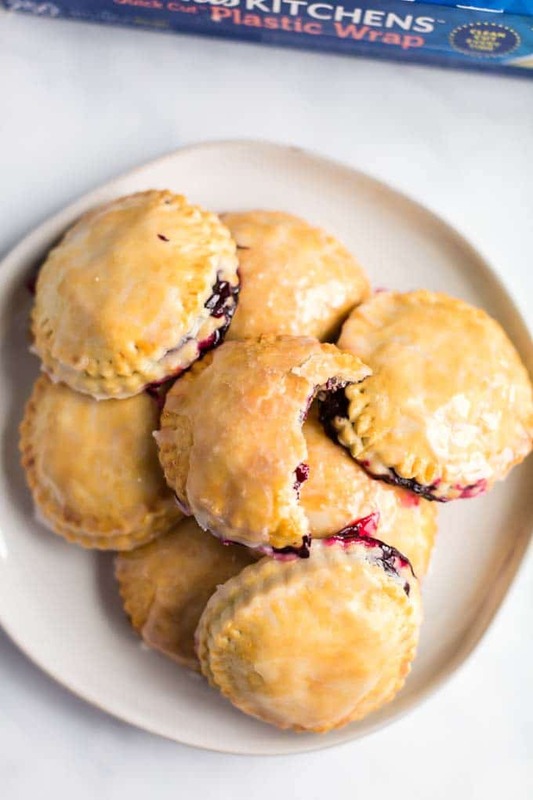 These easy, delicious hand pies are filled with a blueberry filling that will leave your mouth watering for more. 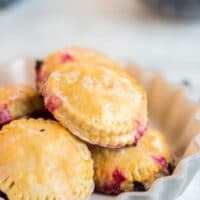 This old fashioned recipe for hand pies is a from scratch, homemade treat that your entire family will love. 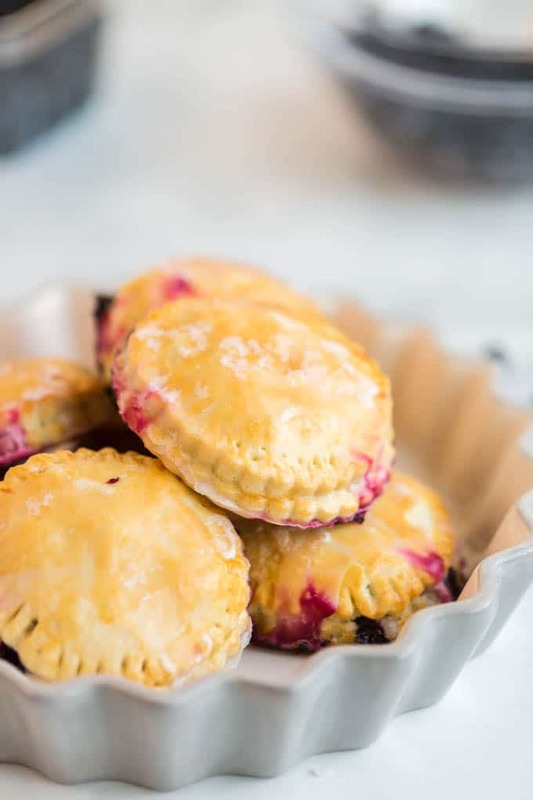 We’re using a blueberry filling for these hand pies — but you could easily change up the filling to your favorite fruit or berry: apple, cherry, or peach are also great ideas. The dough creates the perfect crust that is the perfect partner for fresh blueberries. After baking, add a sweet glaze for a favorite mini treat that everyone will love. I’m excited to share this tasty recipe with you today in partnership with Reynolds Kitchens! 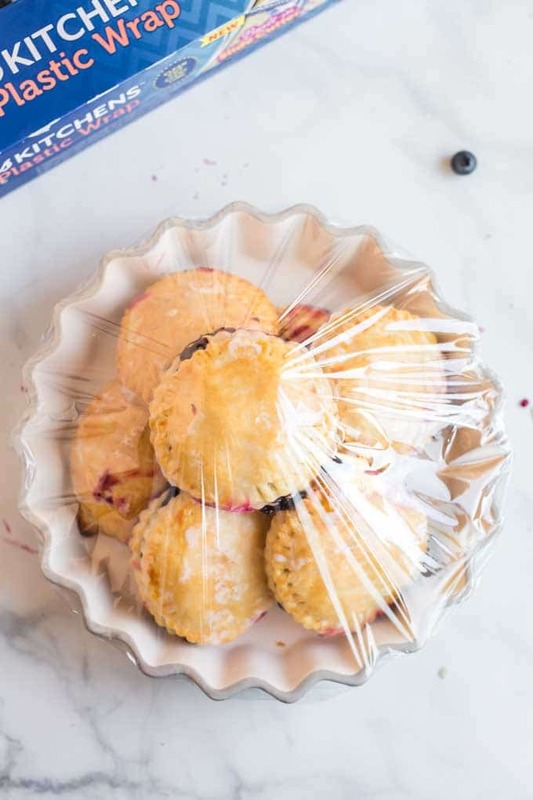 Their plastic wrap is a must-have for this yummy hand pie recipe! Our family has a little bit of a sweet tooth. Ok… maybe a lot a bit. 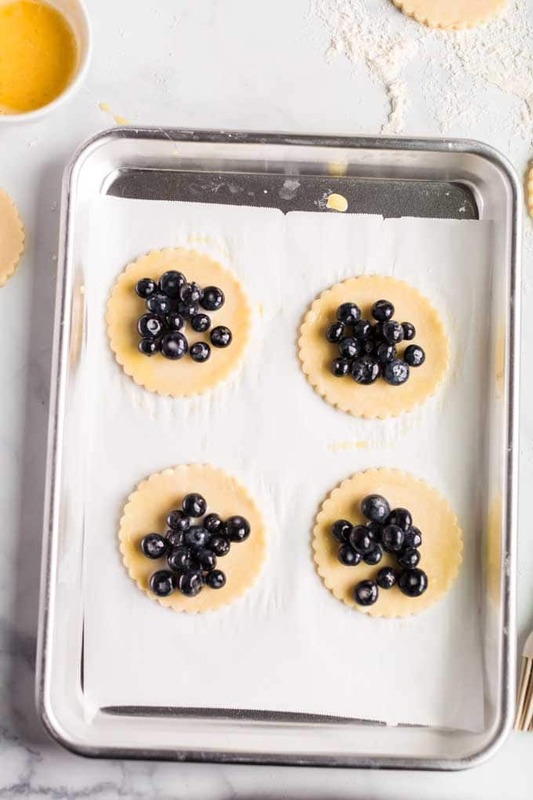 We love baking and enjoying treats together, like these delicious and easy blueberry hand pies we’re making today. I’m sure you’ll agree that this treat baked from scratch is a keeper that you’ll want to create again and again. With endless filling possibilities, they’re the perfect versatile treat to serve anyone you love. We opted for a sweet treat with a berry filling this time. You can use a huge variety of fruits or even make a savory snack as well. Last weekend, we had a playdate with friends. I decided to bake these hand pies to take along as a snack. They were a huge hit! I’ll definitely be baking them more often and trying various fillings. The boys have requested apple hand pies next. I would also like to try cherry and peach! Hand pies are a pastry with either a sweet or savory filling. They’re known to be a Southern treat. You add a dollop of filling in the center and press the dough over. You can bake hand pies or fry them. No matter how you make them or what filling you use, I’m confident you’ll find this recipe to be delicious. Now that you know what a hand pie is, let’s talk about the best hand pie recipe! For today’s hand pies, you’ll need the following items. 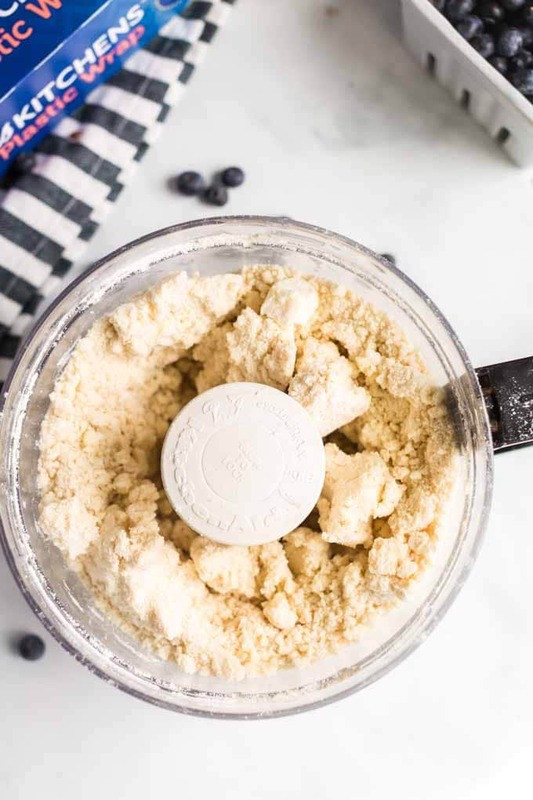 Start with your food processor: add the flour, salt, and sugar. Cube the cold butter into little cubes and add to the flour. Place the lid onto food processor and pulse until the butter is the size of peas. Next, fill a glass with water and add ice, then measure out 1/3 cup of cold water. Slowly add the cold water to the food process a tablespoon at a time, pulsing in between each addition. Once it’s all been added, pulse until the dough comes together. If it’s still dry, pulse a little longer until the dough forms. Divide the dough in half. Place a piece of Reynolds Kitchens Quick Cut™ Plastic Wrap onto a clean surface and place half the dough onto the wrap. As you wrap the dough, form it into a disc. Repeat with the other half of the dough. Place in the refrigerator for at least 1 hour. It’s really important that the dough stays cold as you’re working, so if you have to pause while making this treat, make sure to keep your dough covered in Reynolds Kitchens Quick Cut™ Plastic Wrap inside the fridge. It does a superior job keeping your dough fresh and delicious! 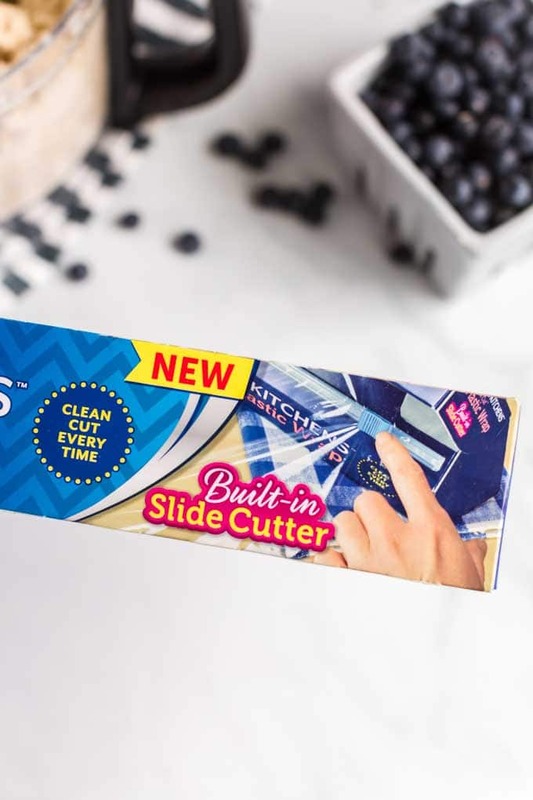 As a side note, I’m totally crushing on their built-in slide cutter that makes it so quick and simple to grab a piece of plastic wrap. This is especially great when your hands are busy in the kitchen. Right before you pull the dough out of the refrigerator, prepare the blueberries. In a medium bowl toss the blueberries with sugar, corn starch, and lemon juice. Set aside. Make an egg wash by beating one egg a small bowl, then set aside. 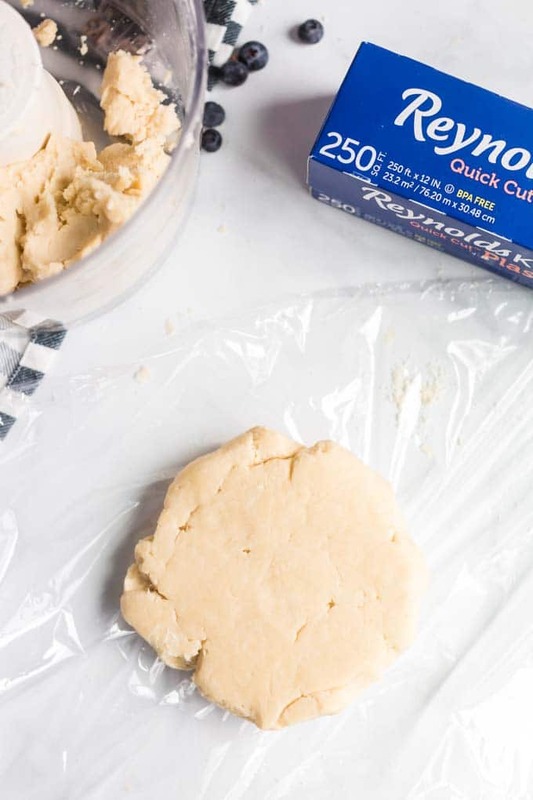 Remove one disc of dough from the refrigerator and remove from Reynolds Kitchens Quick Cut™ Plastic Wrap — it’s ready to work with! Sprinkle a few tablespoons of flour onto a clean surface and then roll out the dough until it’s ¼ inch thick. Using a 4-inch cookie cutter, cut out circles, and then place on a baking sheet lined with parchment paper. Again, I recommend Reynolds Parchment Paper. It helps keep your surfaces clean of dough and keeps the dough from sticking where you don’t want it. I would recommend rolling out the second disc of dough right before they’re ready to go into the oven. If you have any lag time, don’t leave your dough sitting out. Cover with a sheet of Reynolds Kitchens Quick Cut™ Plastic Wrap and pop them back in the fridge until you’re ready to bake. Next up, brush the edges of each circle with egg wash. Place 1-2 tablespoons of blueberries in the middle of one piece of dough. Place the second piece on top. Use a fork to seal the edges. Brush the tops with egg wash.
Bake at 400 degrees for 15-20 minutes until golden brown. Remove from oven and transfer to a cooling rack. To make the glaze, whisk the powdered sugar and lemon juice together. Drizzle over the top of each pie. Let cool before serving. You can place them on a dish wrapped with Reynolds Kitchens Quick Cut™ Plastic Wrap if you’ll be eating them soon or if you’re taking them somewhere to share as I did with our playdate. You can also freeze them for up to three months. After baking and cooling, freeze your hand pies. Once frozen, wrap each pie in Reynolds Kitchens Quick Cut™ Plastic Wrap and place in a freezer safe container or bag. Your entire family will love these hand pies — I hope you enjoy them soon! Easy, delicious, and sweet -- these simple blueberry hand pies are a homemade treat you'll love! In a food processor, add the flour, salt, and sugar. Cube the cold butter into little cubes and add to the flour. Place the lid onto food processor and pulse until the butter is the size of peas. Fill a glass with water and add ice, then measure out 1/3 cup of cold water. Slowly add to the food process a tablespoon at a time, pulsing in between each addition. Once it’s all been added, pulse until the dough comes together. If it’s still dry, pulse a little longer until the dough forms. Divide the dough in half. Place a piece of Reynolds Wrap onto a clean surface and place half the dough onto the wrap. As you rap the dough, form it into a disc. Repeat with the other half of the dough. Place in the refrigerator for at least 1 hour. Make an egg wash by beating one egg a small bowl, set aside. Brush the edges of each circle with egg wash. Place 1-2 tablespoons of blueberries in the middle of one piece of dough. Place the second piece on top. Use a fork to seal the edges. Brush the tops with egg wash.
How can I make this recipe more keto? 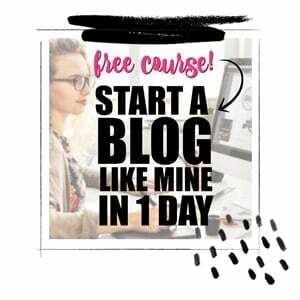 I’m not sure – you would need to check and see what’s allowed with your diet restrictions and adapt. Good luck! Oh my goodness! These are so delicious. I cannot stop eating them. They are easily a family favorite and I love how easy they are to make. A must try!! !